Lie faceup on the floor with your legs bent. Place the arms and hands across the chest. Your upper back should be slightly off the ground to maintain constant tension on the target muscles. Start by training the four basic trunk movement patterns with dynamic or static exercises. Beginners would do well to include exercises that train single-plane basic movement patterns. Fast swimming relies on an athlete’s ability to simultaneously generate propulsive force with the arms and legs while attempting to minimize the drag resistance experienced as she knifes through the water. 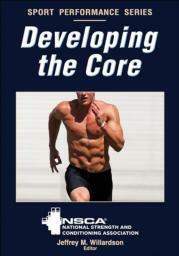 The NSCA, the world’s leading sport conditioning organization, offers its unrivaled expertise in a book perfect for any athlete seeking to strengthen the core and improve athletic performance. Featuring 11 ready-to-use sport-specific programs, Developing the Core provides more than 50 of the most effective exercises along with science-based assessments to help athletes understand their individual needs.